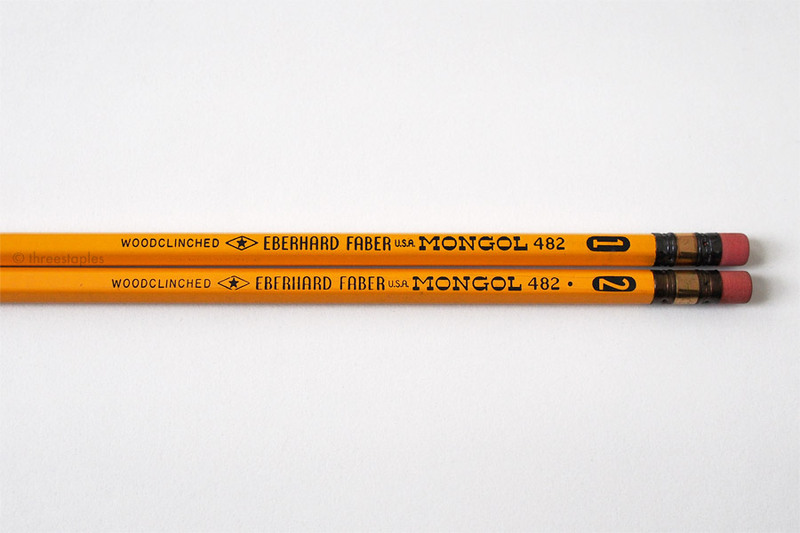 As I got deeper into the world of vintage wood-cased pencils, there’s one pencil that kept catching my attention: the Mongol. I mean, with a name like “Mongol” in that chunky typeface and distinctive ferrule, how can it not? I never grew up with yellow No. 2 pencils, so these don’t evoke any nostalgia in me, but I’m quite smitten with them, especially from design perspective. I’m happy to say that I finally got to try the pencils that made yellow pencils a thing in America. By the way, this is more of an appreciation post, than a detailed review post. It’s definitely not an in-depth look at the history of the Mongol, either, although I’ve taken the opportunity to learn more about it (and having fun while doing so). I added some relevant links at the bottom of the post for more details. Yellow might not be my first color choice in pencils, but I really like how these look with the shiny gold band on the ferrule. Coupled with the big oval for the graphite grade and pink eraser, the dark ferrule makes the pencil really pop, I think. And the lengthy, black imprint in 3 (or more?) different typefaces, including the reverse-contrast slab serif of “Mongol,” adds much to the pencil’s distinctive character. The barrel is coated in glossy varnish, and the imprint is neatly applied. Apparently there are countless number of variations of these pencils. And not until I started taking pictures of these did I notice a subtle difference between them: a tiny dot next to the “482” on the N0. 2 pencil. Even the ferrules look slightly different in color. And I'm impressed that for pencils that are possibly 50–60 years old, I don't see any rust on them. Overall these feel solid in my hand and look very well-made. As with most old pencils, the erasers have dried out. Too bad, because I would definitely use the heck of them if they were still functional. As for the graphite, I prefer the No. 1 over the No. 2 but both write very smoothly. I thought I could compare the No. 1 to some of the Japanese HBs I own but it isn’t as dark. It’s a soft gray, that I’m beginning to appreciate quite a bit, in a firm but smooth tip. Although I haven’t been using these for an extended period of time, I can tell that I won’t have to sharpen these that often. This is just a couple of the posts at Contrapnutalism on the Mongol. I highly suggest you search the word “mongol” at Sean’s site to see more!